I was greatly surprised when I discovered, that PoM never received this album. After my rendezvous with Root’s two re-issues, Hell Symphony and The Book, I wanted more. Not just because I like them, but because I think it is an important band. Root is actually developing our beloved genre, and isn’t getting nearly enough attention. Those two albums were made in the nineties, and as the band is still (very) active, the reviews doesn’t really describes Root at all – as you will read below. I would like offer my thanks to Igor the Bass-player who provided the music, which the label never saw fit to send. And I do apologize the very late review, for an album that hit the stores in 2007. Daemon Viam Invenient contains all the original Root elements – primarily the all-important and dominant vocals of Big Boss, the occult themes, and the stylistic crossbreed of dark metal, prog rock and doom. This, however, is where the comparisons stop. 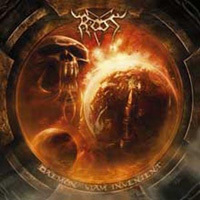 Root has spread out through the metal-genres and applies components hailing from such diverse “places” as death metal and art rock. This branching out is a double-edged sword. It grants great intricacy to the album as a whole, but it also requires an extreme amount of attention from the listener. The sheer complexity of the music sometimes disrupts the listener. This is not a very large problem though. The only real problem with Daemon Viam Invenient is that even experienced, hyperactive crews like Root simply can’t master everything at once. Attacking on all fronts leave the center unprotected, so to speak. And it leaves the front troops spread out thin. In other words, despite from a vivid creativity and more than competent musicians, somewhere in this tapestry of sub-genres, something is bound to go wrong. “Who’re They?”, for example, is a song in which Root utilizes blast beats, and it’s generally very death metal inspired. The drummer (ex-drummer since January 09) can’t seem to maintain the fast monotone rhythm. He lacks. But in everything else on this album he rules, and my point is proven. You might be skilled, might even be an expert, but you simply cannot be good at everything. Root try though, and in most cases succeeds! When it works the genre safari is a huge plus. Like in “And They are Silent” where blackened thrash is mixed with the “normal” (such an inadequate word) Root mixture. It has all the energy of thrash and all the melody of the old Root. And “What Will Be Next”, a strange concoction of avant-punk and dark metal, works very well. When all's said and done the positive sides of Daemon Viam Invenient clearly outweighs the negative ones, and as I’m in the habit of granting rating bonuses for bold experiments, this album gets a high grade. I can live with a few cosmetic mistakes, when the foundation is as rock solid as this. Root’s homepage states that a new album – Heritage of Satan – will be recorded this year, and I can only say I look forward to it! Check out the Metal Inquisition department for more info on that. 10 What Will Be Next?